We stirred before sunrise and got on the road at 7, hoping to make best use of the still before the wind got up again. Unfortunately the wind had similar plans, and before we'd gone 10 km it had become so strong we had to dismount and push the bike to get over the bridge at El Zurdo, virtually on the Chilean border. We managed to get going again and made slow and fitful progress until the road turned northwest and made it 60% sidewind (remainder from ahead of course) at which point it became impossible to keep the bike heading forward. The loose gravel meant the slightest turn would send the front wheel skipping to the edge of the road, the front panniers acting as a sail. Attempts to 'tack' up the road were thwarted by it being impossible to 'bring her around' on such loose ground. One time it even spun us a full 180 and we suddenly found ourselves gathering speed in the wrong direction! The thought did occur that we could be back in Rio Gallegos, undoing 2 day's work, in just a few hours. At least we'd be able to get some fresh food there! But DNF is not an option. Eventually I found the only way to get any control with the sidewind was to hold an unmaitainably high speed, so we took to having bursts of effort followed by recovery stops. By now it was so hard to stand that recovery was also hard work, and the wind chill became serious even though the sun was strong. This routine sonn became stints of pushing the bike from one refuge to the next - we discovered that all along this stretch of road there were half completed concrete drain culverts around a meter wide and high, that you could crawl down inside and hopefully get some shelter if neither end happened to be funneling the wind. Occasionally, on larger ones, the opening itself would make a good barrier and then you could sit in the sun almost oblivious to the gale above you save for the occasional whipped up sand blast. 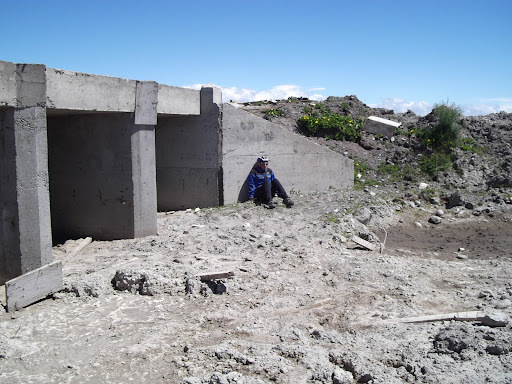 We joked that this - sitting in a half abandoned construction site next to a mud pit with discarded building material all around - was as close as we'd ever get to a beach holiday! The sitting to walking ratio grew, and by 3pm we were spending an hour or more at a time just sheltering. We cooked up a couple tasty meals and started to consider plans. If the storm blew itself out we could set off again anytime in the evening as it's light until gone 11pm and even then it's just twilight never truly dark. Or if the wind persisted, perhaps we could board up one end of a culvert and bed down there. If it started to rain heavily too? Well, lets just hope it wouldn't. We had a lot of time for observations, and one that occurred to me was that not only was this a tough road through tough country, but these were tough people too. Did the land select the people, or shape them? As an illustration at most stops we left the bike by the road as we sheltered out of view. In the UK, an abandoned bike by the road will generally very quickly cause a passing vehicle stop and come looking to check there's no injured rider in the hedgerow, hence the reason Randonneurs always hide their machine when kipping in a field! However out here, when a vehicle did pass (around once an hour) it would speed right past, maybe with a short toot. Most were large pickups; had any stopped to offer a ride we'd have gratefully accepted. Due to the wind you never heard them approach until they'd passed, so if it came to it we'd have to stand out on the exposed road and flag one down! Around 6.30 we the wind had become more gusty: less relentless but just as strong. We decided to have another go for it, and discovered it was just about possible to cycle. We progressed for 90 mins covering about 7 miles, slowly climbing up to higher moor land. In the distance we had seen a radio mast which normally delineates the high point. As we got nearer it became evident the support building next to it was larger than first thought. Maybe a house! No, maybe a hotel! Which did indeed turn out to be the case, but abandoned several years prior. A door was openable, revealing evidence of previous temporary occupants and a deeply musty disused hotel smell. However there were trees and out buildings around the outside making an ideal spot to put the tent in some shelter. Then we noticed more buildings a few hundred meters down the road and so decided to look there before selecting our camp. The road fell about 100 meters and suddenly we were in amongst stumpy trees, green vegetation and a large river! The sudden contrast to high moorland was vivid. We hurried to refill the water bag, and noticed and fairly sheltered spot in some trees right by the river next to remains of a fishman's campfire. Soon the tent was pitched and we treated ourselves to a pasta meal (as there was an abundant water supply) and sat eating by the river under a beautiful sunset. Unbelievable to think just a few hours earlier we'd been looking at sleeping in a drain!